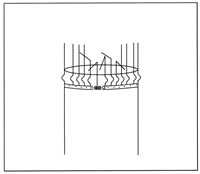 The Defender Chimney Pot Spikes™ is another great invention that needs no extra tools or adhesive. 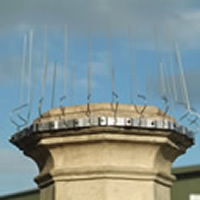 The strip simply wraps around any shape or size chimney pot, square or round, small or large. 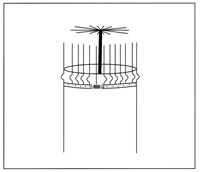 The Defender Chimney Pot Spikes™ strip has an overall length of just 3 ½ feet (107cm). 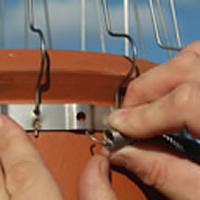 Wrap straps around the top of the chimney pot, pull tight and hook the spring into one of the fixing holes. 1. 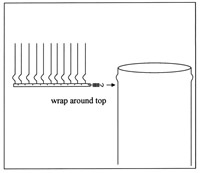 For smaller pots the strap simply overlaps itself, the flexible strap will even bend around square pots. For very large pots simply join 2 straps together. 2. No glue or tools are required, the powerful spring locking clip and serrated strap means that slippage is virtually impossible. Chimney sweeps love them as their brushes can push past then retract with ease. 3. Window cleaners, contractors on ladders, scaffolders, painters etc. have a habit of damaging bird spikes. Warn them to be careful whilst working. A slightly damaged spike is likely to provide an ideal roosting or nesting spot for a bird. Any damaged spikes should be replaced before the birds move in.